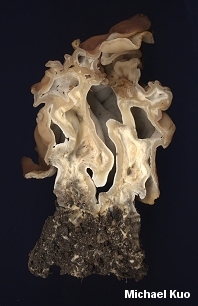 This springtime false morel is apparently limited to the midwestern and eastern parts of the United States. 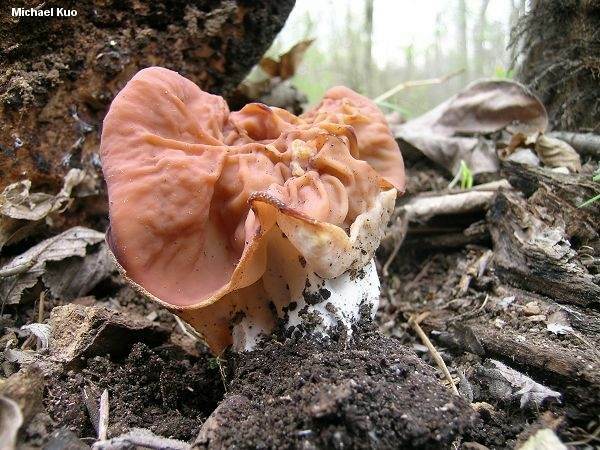 It is extremely variable in appearance, but it can be distinguished from other Gyromitra mushrooms by its tan to reddish brown cap, which is decidedly lobed and often gathered into two or three points, creating a saddle-shaped appearance. The surface of the underside of the cap is creamy to tan--and nearly always visible in "seams" where sections of the cap are joined and appear sewn together. Gyromitra fastigiata, in the sense of some authors (including Weber, 1995) is another name for the species described here--but Gyromitra fastigiata is a European name that has been variously interpreted. I have used an older, North American name (Gyromitra brunnea) for the species. 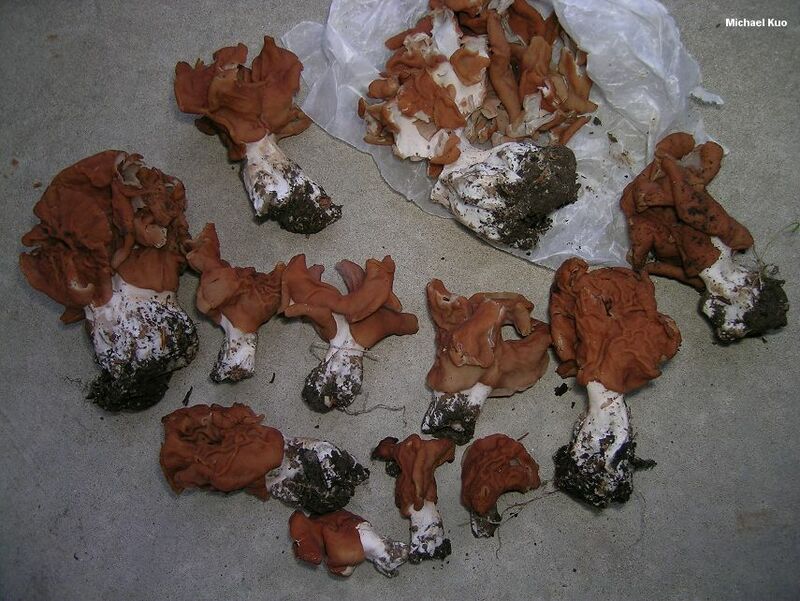 Ecology: Officially saprobic, but potentially also mycorrhizal--or, like the true morels, donning both ecological hats in the course of its life cycle; found under hardwoods (often near stumps and downed trees) in spring; widely distributed in the Midwestern and eastern states. Cap: 3-9 cm high; 5-10 cm wide; variable in shape but generally with 2-5 lobes raised and pinched together in a saddle-shaped formation; tan to pinkish brown or reddish brown; loosely wrinkled; lobes usually joined in seam-like lines; bald; undersurface exposed in places, whitish, downy, frequently ingrown with stem where contact occurs. Flesh: Whitish or flushed rose; brittle; chambered; usually thick in the stem. Stem: 2-9 cm long; 2-5 cm thick; irregular in shape but usually enlarging somewhat toward the base; pale pinkish tan to pure white in age; generally not round in cross-section; bald; often ribbed near the base; sometimes discoloring brown to grayish on handling. 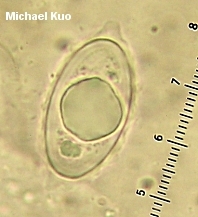 Microscopic Features: Spores 23-30 x 10-15 µ; with 1-3 oil droplets; smooth at first, developing ornamentation as ridges and projections that can extend 1-2 µ from the surface of the spore, or 2-5 µ at the ends of the spore, where projections appear as 1-5 apiculi; the ornamentation eventually sheathing the spore completely. Asci 8-spored. 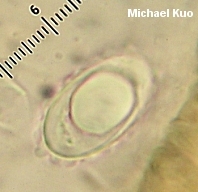 Paraphyses clavate to subcapitate; 5-10 µ wide; septate several times; orangish to reddish. REFERENCES: Underwood, 1894. (McKnight, 1973; Smith, Smith & Weber, 1981; Weber & Smith, 1985; Lincoff, 1992; Horn, Kay & Abel, 1993; Weber 1995; Abbott & Currah, 1997; Roody, 2003; Kuo, 2005; Miller & Miller, 2006.) Herb. MICH: NSW 4500, W. Sturgeon 79-1. Herb. BPI: 566972/84050606. Herb. Kuo 04089502, 04010301, 04140403, 05260407, 05270407, 04050501, 04070501, 04150501, 04270501, 04100602, 05050604, 04250801, 04280801.